Needles found in strawberries in two more Australian states. ALDI has announced it will start stocking strawberries again amid a nationwide needle scare. An Aldi Australia spokesperson said the organisation had spoken with strawberry growers and regulatory officials over the weekend, and would re-stock its shelves with selected brands. “Now that we have processed all the facts and checked with the investigating authorities, our priority is to restore supply to ensure the impact to our primary producers is contained as quickly as possible,” the spokesperson said. It comes as New Zealand supermarkets announced it would stop selling Australian strawberries. Foodstuffs and Countdown (owned by Woolworths) — which between them control nearly the entire New Zealand grocery market — on Monday announced they had stopped sending out Australian strawberries to their stores. In separate statements, both said while none of their products had been affected by a major recall in Australia, they wanted to reassure customers. “We have elected to halt any further distribution of Australian strawberries to give our customers added peace of mind,” a Foodstuffs spokeswoman told news.com.au. New Zealand imports the fruit from Australia when it’s out of season, from April to September, and both chains say the Kiwi product will be on shelves shortly instead. Vice-president of the Queensland Strawberry Growers Association, Adrian Schultz, says what started with a single act of “commercial terrorism” has brought a multi-million-dollar industry to its knees. “I’m angry for all the associated people, it’s the farmers, the people who supply them, the packaging people, the truckies with families to support, who suddenly lose their jobs … it’s far-reaching,” he said. Cabinet minister Christopher Pyne says he understands why New Zealanders are baulking at Australian strawberries. He urged authorities to throw the book at whoever was responsible. “I hope we catch them and prosecute them and they spend a lot of time behind bars, because that’s what they deserve,” Mr Pyne said. Nationals frontbencher Andrew Broad has blasted the culprits as “low-life scum”. Queensland Police are leading an investigation into the source of the needles, and the state’s Premier Annastacia Palaszczuk has stumped up a reward of $100,000 for anyone with information that leads to the capture of the culprits. “How could any right-minded person want to put a baby or a child or anybody’s health at risk by doing such a dreadful act?” Ms Palaszczuk said yesterday. Police suspect the needles were deliberately planed “obviously to injure somebody”. Health Minister Greg Hunt has also ordered the national food safety watchdog to assess the states’ handling of strawberry contamination. Needles or pins have reportedly been found by consumers in six states and territories: NSW, Queensland, Victoria, South Australia, Tasmania and the ACT. Western Australia and the NT have not been impacted so far, although a WA supplier of strawberries was the source for the SA scare. Police believe some of the needles/pins found may be the work of copycats. Tasmania police is investigating claims strawberries spiked with needles were found in a Hobart supermarket on Sunday. A customer returned a punnet of Pinata brand strawberries to Rosny Park Woolworths supermarket purchased earlier in the day, alleging the fruit had been contaminated by a needle, according to The Mercury. Earlier on Sunday, South Australia was struck by the saga. 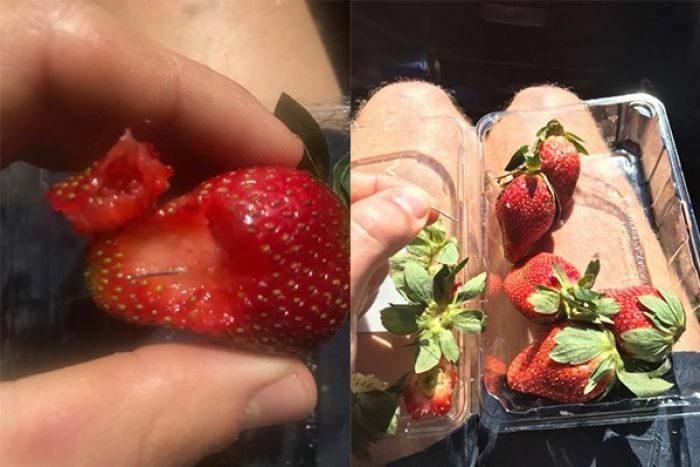 A customer made the discovery while eating fruit from a punnet of Mal’s Black Label strawberries on Sunday, South Australia Police say. The punnet was bought from Klose’s Foodland Supermarket in Littlehampton on Saturday with the independent grocery retailer pulling the strawberries from all its shelves. There are claims sewing needle contamination has been found in up to eight separate brands of strawberries: Berry Obsession, Berry Licious, Love Berry, Donnybrook Berries, Delightful Strawberries, Oasis, Mal’s Black Label and Pinata. Coles and Aldi have both pulled all strawberries from their shelves, except in Western Australia. Woolworths confirmed it had removed the Oasis and Love Berry brands from its shelves, with Berry Obsession, Berry Licious and Donnybrook going earlier in the week. The strawberry industry is pleading with customers to keep buying the berries, but to cut them up before eating them to ensure they’re safe. “This is food terrorism that is bringing an industry to its knees, said Strawberries Australia Inc Queensland spokesman Ray Daniels. “But I would say to people, we produce 800,000 punnets a day and seven needles were found. You’ve got more chance of winning lotto than being affected. Anyone who believes they might have swallowed a needle should call 13 HEALTH (13 43 25 84) or speak to their GP. Anyone who finds a needle should call police on 131 444.